Dimensional Control Systems, developer of 3DCS Variation Analyst Software, has released a new version featuring advanced GD&T application and validation, single model multi-variant modeling and improved statistical outputs. Dimensional Control Systems (DCS), engineering software developer, has released version 7.6 of its flagship tolerance analysis software 3DCS Variation Analyst. This new version features enhanced GD&T interfaces and applications, making it easier to model tolerances, validate GD&T and increase analysis granularity. Additional updates include a new method to save multiple model variants, allowing users to switch between model builds with the push of a button. 3DCS software is an advanced tolerance analysis package integrated into Dassault Systemes’ CATIA, Siemens’ NX and PTC’s Creo CAD platforms, as well as a standalone CAD neutral platform. As the standard for variation analysis software across the automotive and aerospace industries, 3DCS offers powerful tools for engineers and designers to simulate their product’s assembly process and 3D tolerance stack-up to reduce scrap and rework and root cause quality issues that could lead to warranty and liability claims. The GD&T interface has been added and rebuilt to provide a more intuitive process to create GD&T on the model, and validate existing GD&T. 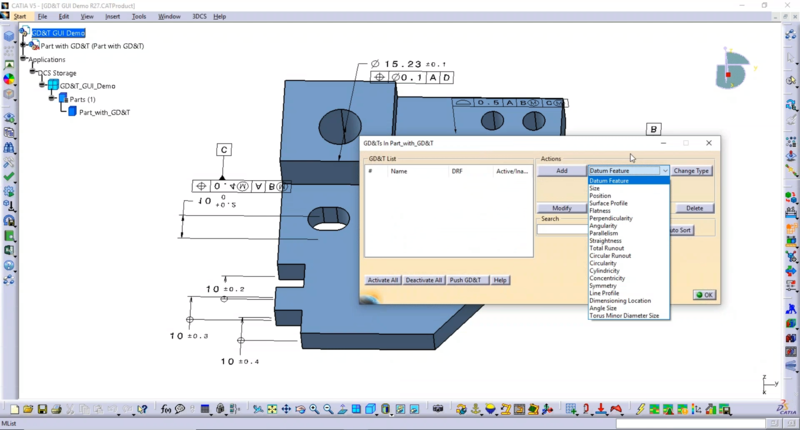 Users now have the ability to create GD&T instead of needing to extract the FTA and PMI from the model or create point and feature tolerances. Of course, all versions can utilize extracted PMI from the CAD model, but now offer an easy to use solution for when that data is unavailable. In order to support DCS’ clients worldwide, the software comes with the ability to utilize both ISO and ASME standards for GD&T. Model Variants have been added to the new version of 3DCS. This much requested feature allows users to designate different model builds within the same model. This reduces issues with version control, as well as removing the need for multiple cloned versions of the same model in order to simulate different processes, parts or tolerance schemes. Now, within the same model, users can define different assembly methods, tolerances or GD&T, and measurements for each variant, swapping between them with the push of a button. This makes it easy to model different what-if scenarios, or to model parts and processes from different suppliers. With the added functionality of both multi-core processing and cloud based distributed processing, it becomes a simple process to switch between variants and quickly run analyses to compare outputs. DCS works to help its clients adopt new practices and apply the latest additions to 3DCS software through training classes and their series of webinars. 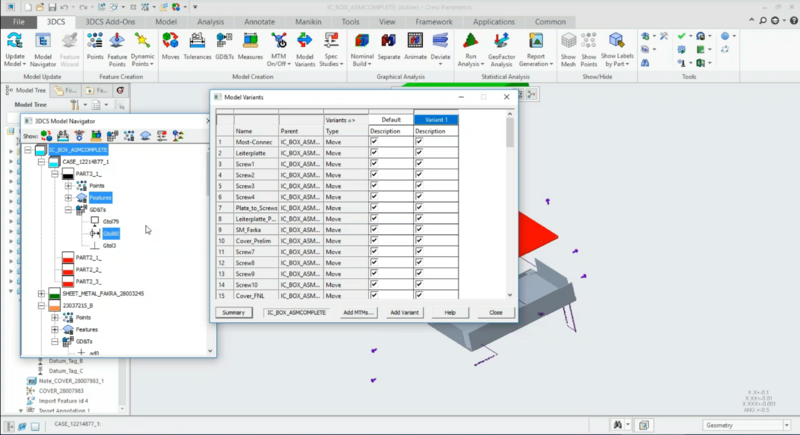 The current Webinar Series, Digital GD&T, features how-to videos for the new GD&T interface, a walkthrough of the new Model Variants, and demonstration of the latest versions features. Other helpful topics include a close look at the Pattern Move, a method of assembling patterns of holes and pins virtually, as well as guides for creating PMI and FTA in the CAD platform to drive later tolerance stack ups. Join DCS for their next webinar, Feature Based Modeling on April 25th, 2019 and watch the last weabinar What’s New in Version 7.6 - Model Variant, recorded on March 28th. To see more webinars On-Demand, go to https://www.3dcs.com/technical-support/dcs-webinars-on-demand.